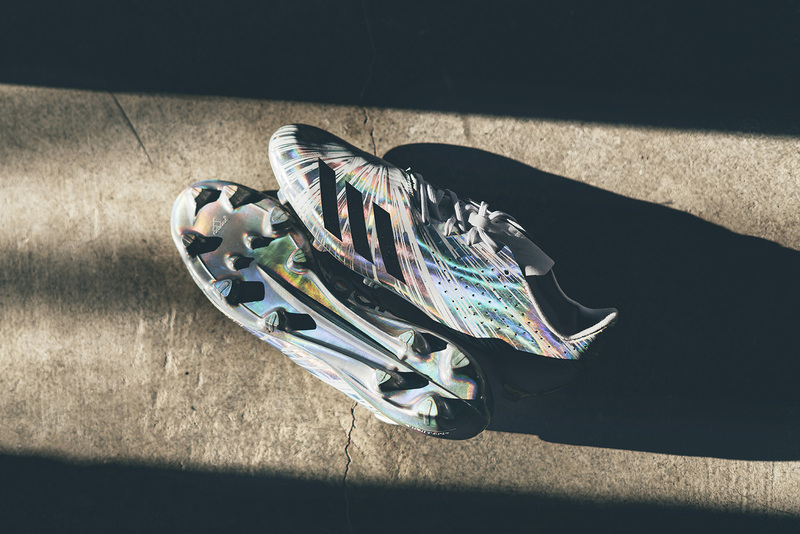 adidas Football unveils the latest cleat pack inspired by the speed of light. 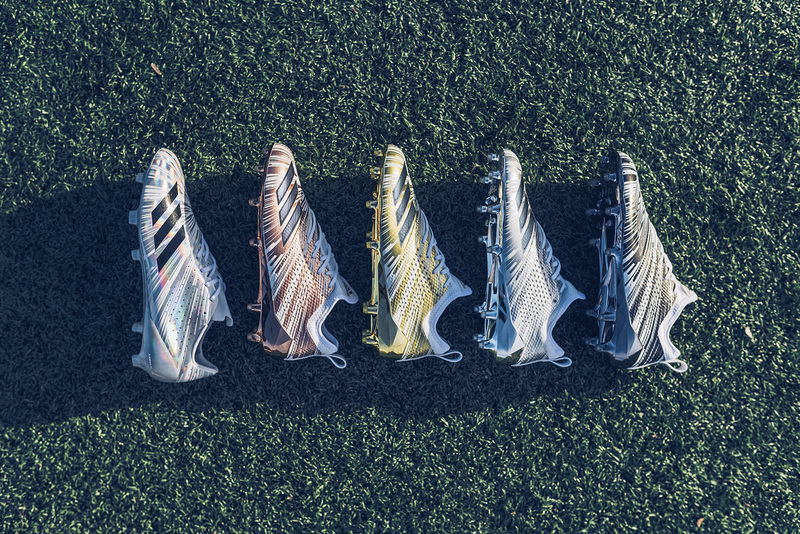 A total of 7 cleats will be rolling out this weekend, each of which feature their own unique metallic colorway with the addition of a hologram iteration and primeknit. A Gold, Bronze, Silver, Black, Hologram and a Black and White PK cleat make up the entire pack, all of which feature their own unique tech fitted for the field. The adizero 5-Star 40 ($140) – Created specifically for the 40-yard dash and weighing in at only 4.8 ounces, the Speed of Light adizero 5-Star 40 is the lightest cleat in the game. Featuring a speed of light hologram graphic that changes colors in different lighting, the adizero 5-Star 40 is constructed from an ultra-lightweight, yet extremely strong fiber SPRINTSKIN upper that is engineered to provide reinforcement only in key support zones for speed. The upper sits atop a matching hologram style SPRINTFRAME football plate to help provide players with the ultimate acceleration for the 40-yard dash. Additional details include a sockliner with the equation for the speed of light: 6.71 x 10^8 MPH. 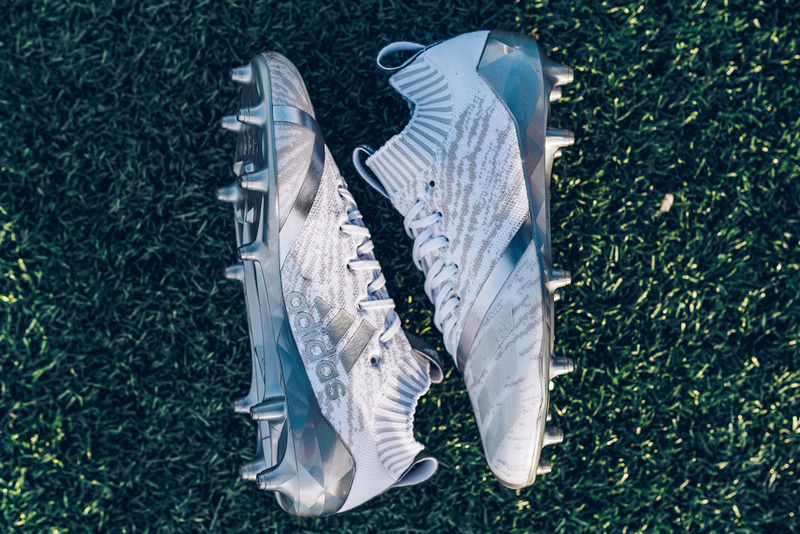 The adizero 5-Star Primeknit ($150) – Bringing sneaker style and insights from the streets to the gridiron, the comfortable and lightweight 8.2 oz. Speed of Light adizero Primeknit has an all-new refined shape that is sculpted to wrap around the foot to provide a sock-like feel. Inspired by innovations from the adidas Running Uncaged UltraBOOST and adidas Originals NMD silhouettes, the adizero Primeknit utilizes a one-piece bootie construction to naturally move with the foot on the field, allow for flexibility and movement through the ankle, and provide comfort and maximum breathability. The precision fit upper features a speed of light graphic pattern that is woven into the Primeknit. The cleats are powered by a metallic electroplated SRPINTFRAME with strategically placed SPRINTSTUDS with a rotational traction zone for multi-directional strength and unrivaled traction. The adizero 5-Star 7.0 ($130) – Designed for speed and built for playmakers, the 8.0 oz. 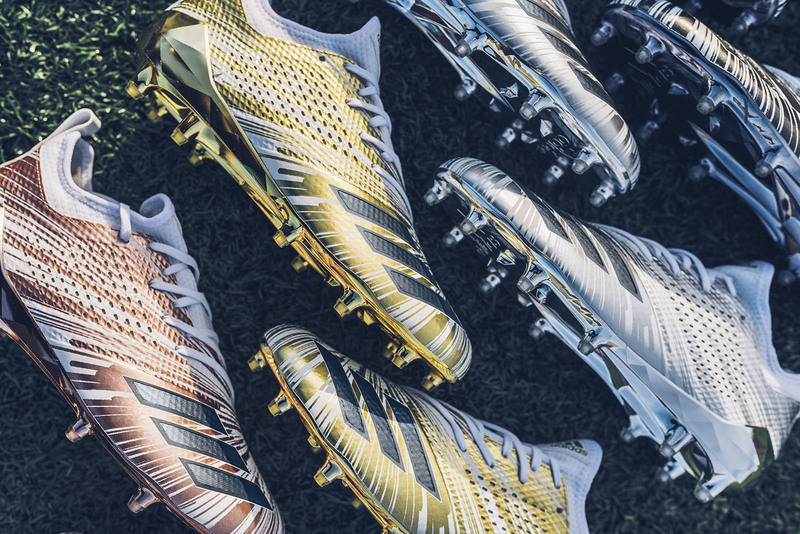 Speed of Light adizero 5-Star 7.0 is available in rose gold, gold, silver and black. 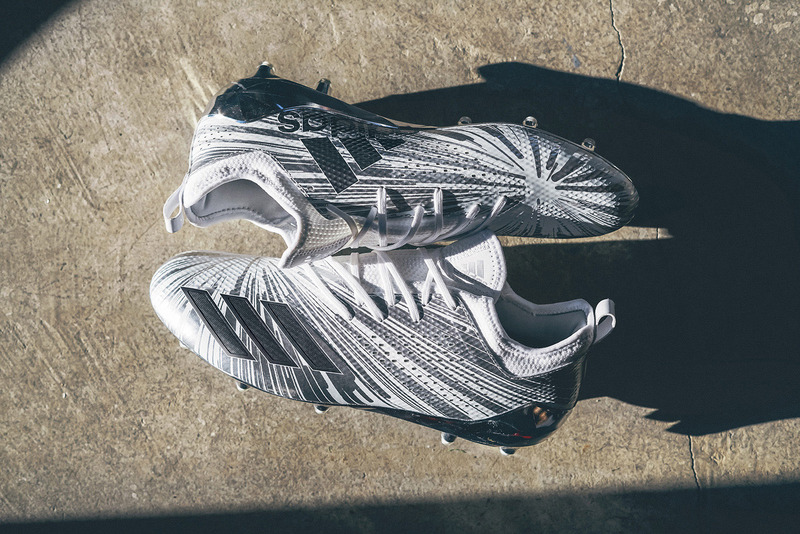 The lightweight cleats are fabricated from a flexible SPRINTSKIN for added durability and feature a speed of light graphic pattern emblazoned onto the upper. The design sits atop an electroplated SRPINTFRAME with strategically placed SPRINTSTUDS and a rotational traction zone that blends comfort, strength and traction. The adizero Speed of Light pack will be available at adidas.com, Eastbay.com and dickssportinggoods.com on February 16.